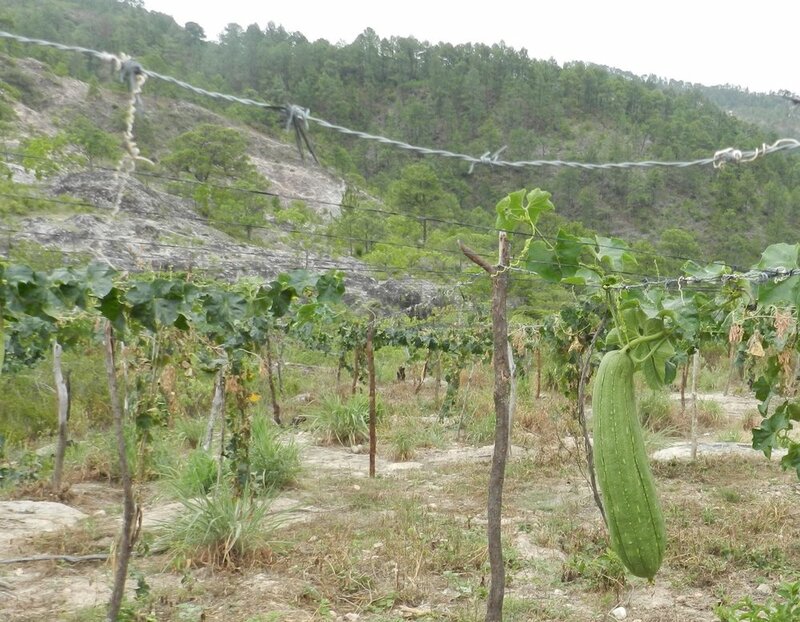 The loofah plant (L. aegyptiaca) is grown on family farms in the rural village of El Rodeito, in the southern mountains of Honduras. Mayor Potencial is supporting the continuity of this local agri-business, by empowering women as they earn money for their families. The people of El Rodeito depend on sustenance agriculture, but with the climate change and resultant drought, they have been struggling to survive. Honduras is caught in what the United Nations describes as the “dry corridor,” and sadly it is only expected to worsen. The good news is that Loofah plants thrive in these dry conditions. One of the first families that Mayor Potencial is working with in El Rodeito, Honduras, is Dinora Reyes and her husband Don Santos Oyuela. They have three children ages 8, 13 and 15. Don Santos, with help from his wife and children, does the agricultural work of raising the loofah plants. Dinora sews and finishes the loofah products, and employs a local teenager when there are large orders to fill. The loofah business has helped Dinora and Don Santos to stay afloat as they deal with the ongoing drought in El Rodeito, by providing them with an additional way to support their family. The loofah products are typically sold at a market in Tegucigalpa, but may also be sold on the streets in tourist areas and from door to door. However, the market in Honduras is saturated with other similar vendors, which makes it difficult for this family to sell enough to feed the family. For this reason, Mayor Potencial is partnering with Dinora and Don Santos to bring this family-produced product to the United States. The process of making the loofah product starts with planting the crops. Loofah plants take four months to mature and produce the loofah vegetable, which is related to the cucumber. Once the loofahs are ready, they are picked and set to soak for eight days. After soaking, they are then peeled and the spongy skeleton is hung up to dry completely, which takes another nine days. When completely dry, they are cut to the desired size and used as is, or flattened. Finally, Dinora sews cloth around the rims of the product, and they are ready to go! And…a corn grinder is purchased! Corn is a staple in El Rodeito. Each morning, before work, corn is ground and food prepared for the day. Because of the ongoing drought, and failing crops, the residents lost their corn grinder several years ago, and were forced to walk to the next village where they had to pay to grind their corn. With help from Mayor Potencial and a low-interest loan, Don Santos and his family were able to buy a corn grinder in January 2017! The grinder is used by everyone in the community. Each family can now get their corn ground for tortillas and be ready to face the day! You can make an impact by supporting this family-run business! Follow us on instagram or facebook to receive updates about the products.